Andre's Fortress: Another twist to the tale? Contrary of rumours of a move to a Qatari stadium, apparently the latest and greatest is that the Syrians had planned to use Abu Dhabi, UAE, as their home venue. One possible reason for this is because Australia have a somewhat poor record in the Middle East - if this is true that is a smart tactic. The Arab heat and conditions make it difficult for us to adapt. "With the first leg of the AFC play-off to take place on October 5, it was reported on Monday night that either Jordan, Qatar or the United Arab Emirates will play hosts to the war-torn Syrian team, who backflipped on their initial desire to play in Malaysia." However, apparently the Syrian players are having difficulty obtaining Emirati visas. 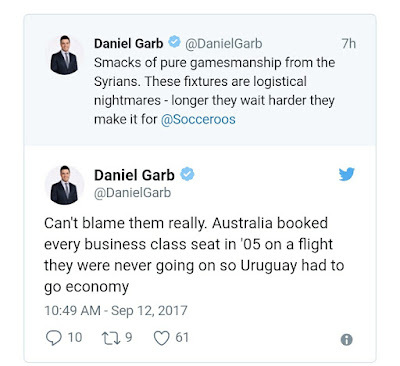 (There is the other issue of some ME countries not wanting to be seen endorsing the Syrian team due to certain political implications which I won't go into.) This has resurrected the possibility that Syria's home leg will be played in Malaysia. In any event these delays are not helping the Socceroos' logistical preparations for their away leg of this critical 4th Round clash in AFC World Cup Qualifying. So is this a shrewd delaying tactic on the part of the Syrians or should we give them the benefit of the doubt? Probably the latter given the fact that they've not had access to a proper home stadium. 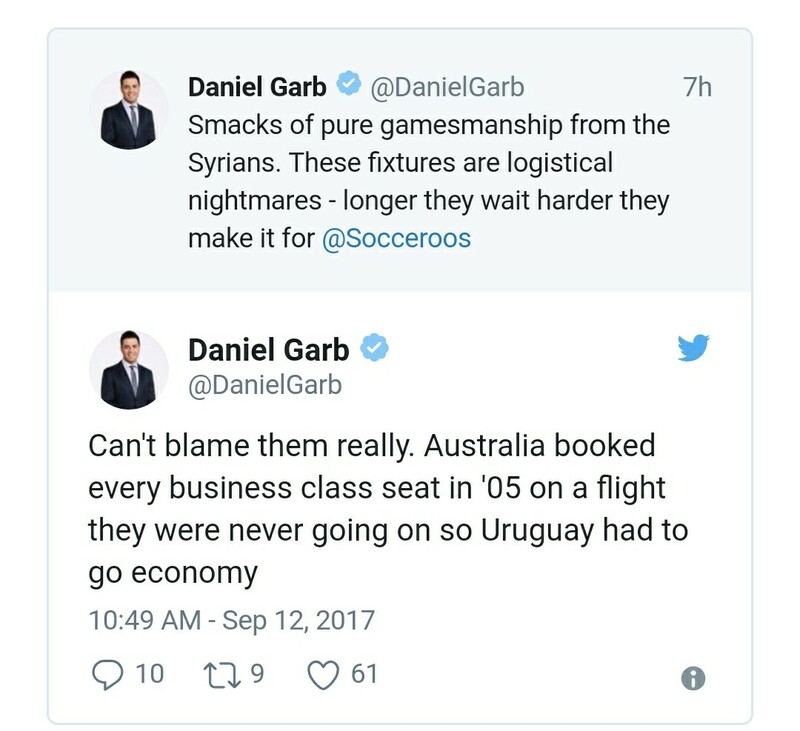 Apparently this incident can be compared to the lead up to the Uruguay match in 2005, where the Aussies supposedly bought out all business class plane tickets from Montevideo to Sydney, thus causing the Uruguayans to take economy class. The lengths some teams will go to just to 'win' is always amusing. But this isn't just any kind of winning here. It's for a shot at the 2018 FIFA World Cup. Regardless, I don't like stalling or other non-sporting tactics - regardless of who uses them.